Until the bombs fell, it was a morning like any other at Holy Cross Catholic School. Children and teachers gathered in the schoolyard. Morning prayers were said and lessons had just begun when an aircraft from the brutal Islamic government of Sudan appeared overhead and dropped the first of five bombs. Some of the victims heeded their headmaster’s cries to “lie flat,” while others -12 of the youngest children and their teacher -sought shelter behind a sycamore tree. By 9:15 the bloody carnage was completed. Those who had hidden behind the tree lay dead or dying. Seventeen more were critically wounded. 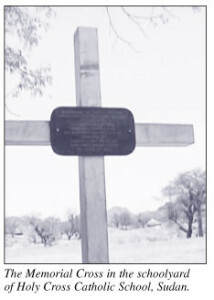 Today, a six-foot-high metal cross marks the site where 19 students and their teacher died on the 8th of February, 2000. 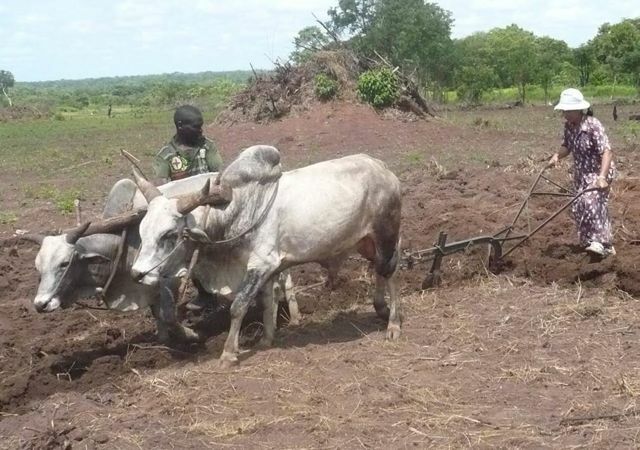 Sudan Relief Fund wrote to supporters describing this tragedy while vowing to continue to move beyond the first makeshift schools to the development of the first full-fledged educational system ever in the diocese. We’re helping build classrooms and purchasing benches, desks, books and school supplies for the growing numbers of secondary school students in the region. We’re building centers of education and religious formation. Additionally, we’re building basic housing for catechists and teachers, so that they will have clean and safe places to live while doing God’s work in the diocese. 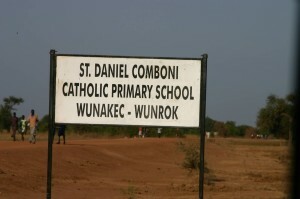 And we are helping spread the Holy Gospel -the healing, merciful, loving message of Christ Jesus- to the most remote and dangerous corners of the diocese. However, there are other challenges we have to overcome. Because we believe in the best education for both boys and girls, we are going against a strong cultural tradition amongst many in the El Obeid diocese. Girls are often removed from school at a young age to be married off in order for the family to gain a dowry. With kids soon on the way for the new wives, it becomes impossible for these girls to even finish a primary education. Our solution is to offer an alternative. 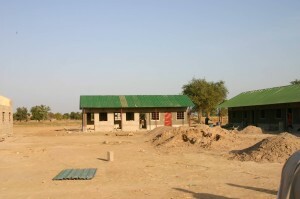 By creating safe boarding schools for the girls we are able to continue their education. While there, they are able to sew and produce goods which are sold, the money then in turn goes to support the families of the girls who would otherwise need the dowry. This sewing, as well as other basic work keeps them independent and in school and moves us closer to the day when the destructive practices of survival economics will yield to the inherent dignity and worth of every one of God’s children.